Mourinho was in fine form after the 2-0 victory. 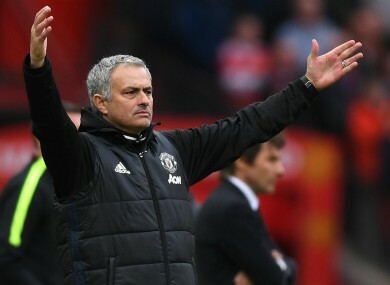 MANCHESTER UNITED MANAGER Jose Mourinho thinks his side “totally controlled” Chelsea during their 2-0 Premier League victory at Old Trafford. Marcus Rashford and Ander Herrera scored early in each half as United blew the title race wide open and boosted their own hopes of finishing in the top four with a valuable victory at Old Trafford. Mourinho felt United were dominant as Chelsea failed to register a shot on target in a league match for the first time since September 2007. And the United boss believes the victory proves his team would have beaten Chelsea in last month’s FA Cup quarter-final tie, had Herrera not received a controversial red card in that match at Stamford Bridge. “We were tactically very good and the players did an amazing job,” Mourinho, who pointed to the United badge as he walked off the pitch, told Sky Sports. “They totally controlled a team full of fantastic players, who are creative and fast. We controlled them totally and I am really happy. “It was the same tactics as when we went to Stamford Bridge in the cup. “That game was totally controlled when we played with 11 players and only the [refereeing] decision that made us play with 10 players for all the second half, plus 10 minutes in the first half, gave Chelsea a chance to be dominant. “We knew that playing this way would be very difficult for them. Mourinho added to MUTV: “They struggled to cope with everything. They struggled to cope with us defensively and they struggled to cope with us with Marcus and other target points we had on the pitch. Email “Jose Mourinho: Man Utd 'totally controlled a team full of fantastic players'”. Feedback on “Jose Mourinho: Man Utd 'totally controlled a team full of fantastic players'”.